CAA's annual list of the worst roads in Ontario is out. Do you regularly travel on a road that made the list? The results of CAA's 2017 Worst Roads survey are in, and it's bad news for drivers in Hamilton: Burlington Street East, which has made an appearance on the annual top 10 list since 2009, finally took the top spot. "I hope that CAA's spotlight will spur some much-needed improvement on Burlington Street East and the many other Hamilton roads that require immediate attention," said Paul Miller, MPP (Hamilton East-Stoney Creek). "We must invest in the repair and maintenance of our existing infrastructure as well as in building new transport connections. People depend on this road to be safe." Many of the streets featured in this year's Worst Roads survey are not first time offenders. Bolded streets also appeared on the list last year. Over 3000 roads across the province were nominated this year, the highest number since the campaign's inception. Roadways were nominated for a variety of reasons including deteriorating pavement, poor or non-existent cycling or walking infrastructure, poor road signs, or potholes. Potholes can wreak havoc on automobiles and many drivers look to their auto insurance for help to offset the cost of the damage. However, hitting a pothole that causes damage to your vehicle is likely to be considered an at-fault collision as it is a single-car accident. To file a pothole claim, you must have collision coverage, and even then, it might not be worth it to go through your insurance. Before submitting a claim, you'll want to factor in the cost of your deductible, your claims history, and the potential for premium increases. It might be better to pay for the damages out of pocket. As an alternative to filing an insurance claim, many drivers seek reimbursement from the city where the pothole was located. 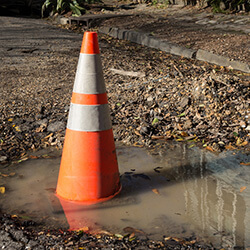 In Ontario, your claim will typically be considered if the city (or municipality) failed to meet the minimum maintenance levels for that specific type of road. In either case, document the damage as much as possible. Take pictures of the damage to your vehicle, and, provided it is safe and possible, the pothole itself. Your best bet for avoiding pothole-related damage is to avoid potholes altogether, or at least take measures to lessen the blow. Make sure your tires are properly inflated as this can help mitigate damage. Leave plenty of space between you and the vehicle ahead of you. This will give you the time needed to spot a pothole ahead and calmly, and safely, avoid it. If the pothole is unavoidable, slow down by taking your foot off the gas. Avoid braking while driving over a pothole as this can cause additional damage. Hold firmly onto the steering wheel so you don't lose control of your car. Take your car into a mechanic if you suspect any damage. A healthy car is a happy car. Shocked that a road in your area wasn't listed? While it may not have made the list of the top 10 worst in the province, it may have made the list as one of the worst roads in your region. The following infographic from CAA lists the worst roads in Toronto, Ottawa, Hamilton, and Niagara, amongst others.